Top defense officials of South Korea and the United States agreed Monday to strengthen cooperation in facilitating ongoing diplomacy to achieve the denuclearization of the peninsula, Seoul's defense ministry said. 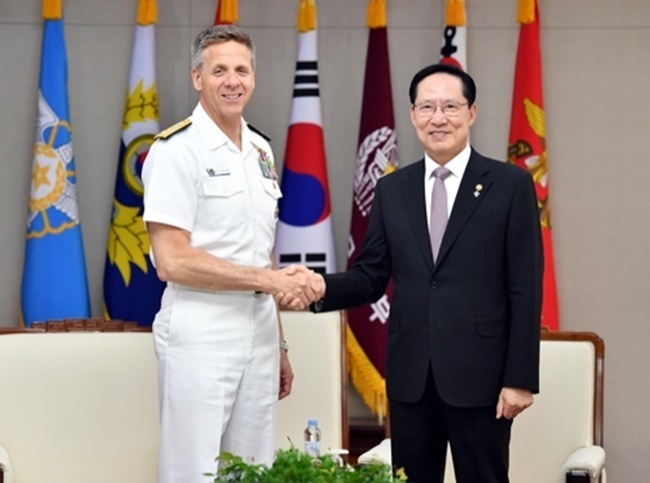 South Korean Defense Minister Song Young-moo held talks with Adm. Philip Davidson, the commander of the US Indo-Pacific Command, in Seoul amid a flurry of the allies' talks with the communist state aimed at Pyongyang's nuclear disarmament. "Minister Song and Adm. Davidson shared the view that close consultations between South Korea and the US are more important than at any other time, as this year marks a significant point for the denuclearization of the Korean Peninsula and the establishment of a peace regime," the ministry said in a press release. "And (the two sides) agreed to reinforce communication and cooperation between the military authorities of the South and the US," it added.